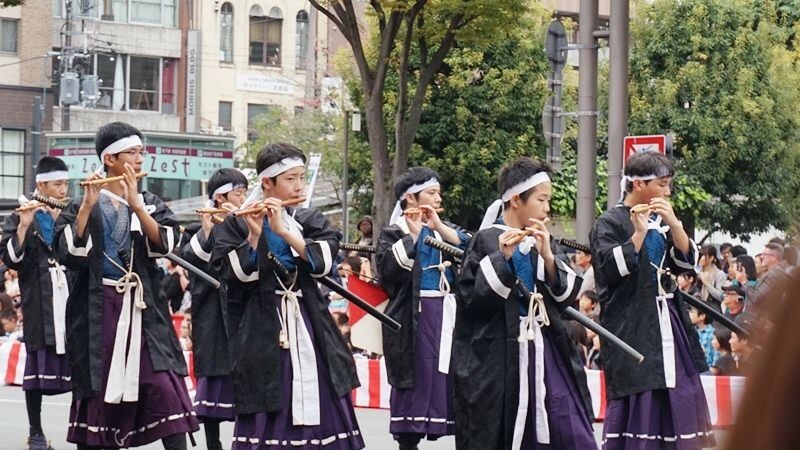 One of Kyoto's Big Three Festivals, the Jidai Matsuri reenacts 1,000 years of Japan's history! Sharing Kyoto's writers went to Jidai Matsuri to experience everything the huge festival has to give! 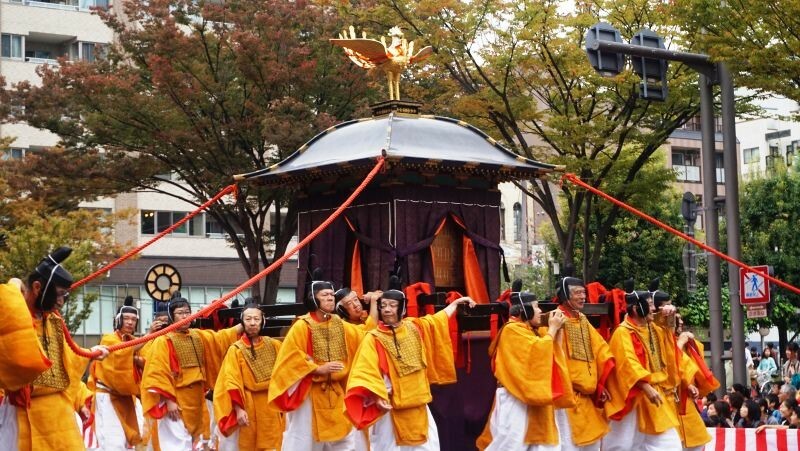 One of Kyoto's Big Three Festivals, the Jidai Matsuri is held annually on October 22. It's famous as a costume parade of historical figures and people dressed in costumes from the different eras of the 1,000 years when Kyoto was the capital of Japan. The parade shows the time from the Enryaku Period (782-806) to the Meiji Restoration in 1868. The highly refined costumes make the parade look like a "live-action picture scroll." Since this is Kyoto's most famous autumn festival, many Japanese and foreign tourists were in Kyoto this day! 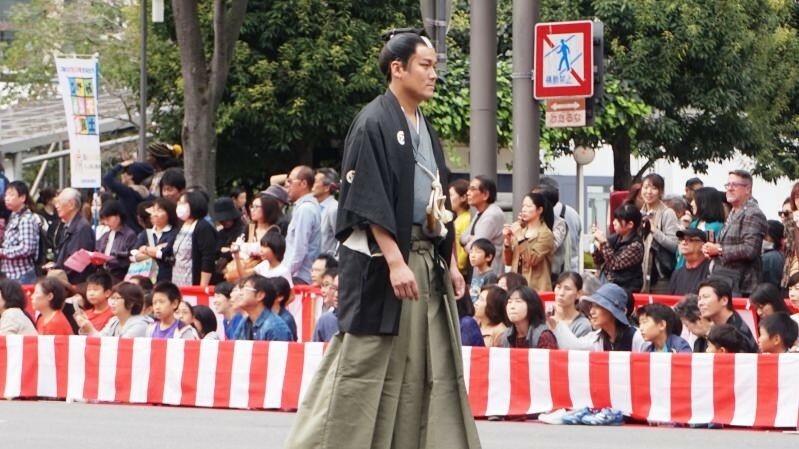 The Jidai Matsuri parade has about 2,000 people in costume stretching for about 2 km. They take three hours to parade from Kyoto Imperial Palace to Heian Shrine. You can watch the parade at various places along the route. We watched it in front of Kyoto City Hall near Teramachi-dori road. 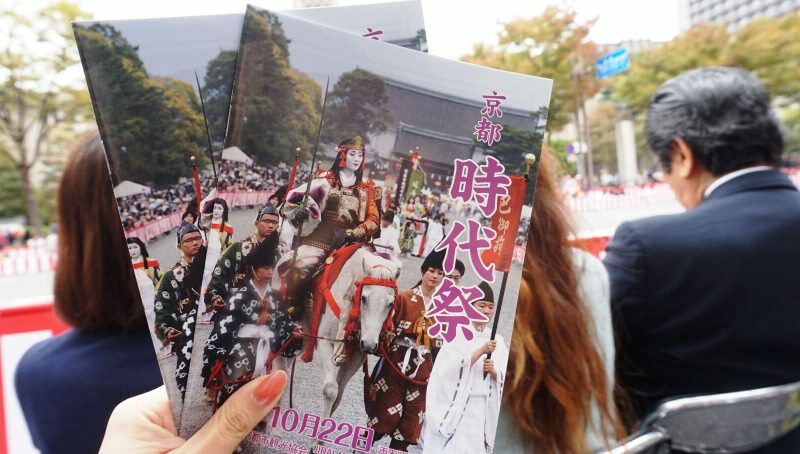 Jidai Matsuri pamphlets were sold for ¥800 along the parade route. It explains the history of the festival and other details! The pamphlet also has detailed information in English. You can learn a lot about the parade and costumes so we recommend that you buy one. After 1:00 p.m., the Jidai Matsuri parade arrived in front of us! This year, October 22 fell on a Saturday so there were more spectators than usual. 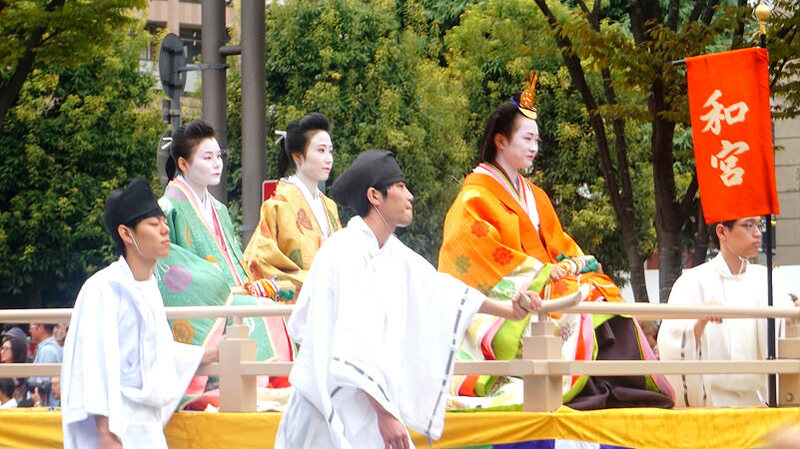 The parade starts with the most recent period (Meiji Restoration) and goes back in time. 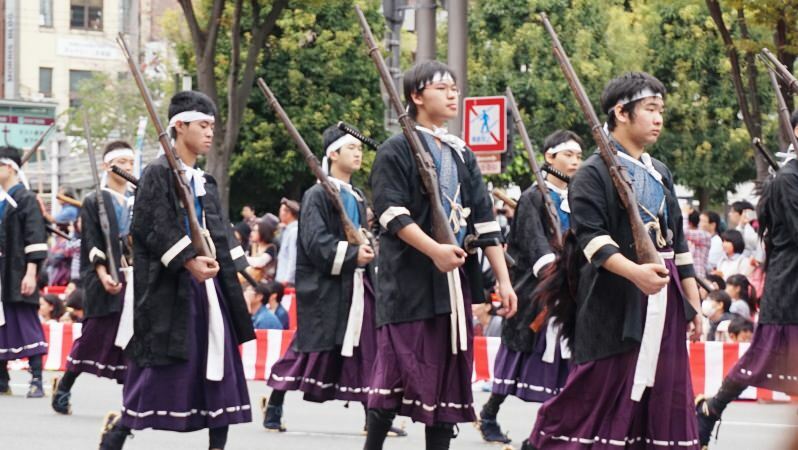 Every year, the parade is led by the Meiji Restoration's Imperial Army in the photo. The Meiji Restoration was a movement that restored Japan's ruling power to the emperor after the Tokugawa government was overthrown to end the Edo Period. During this time, samurai loyal to the Tokugawa rebelled. The Imperial Army depicted here were volunteers who joined to suppress the rebellious samurai. These young flutists were great. They marched in perfect unison in both speed and stride. Impressive. 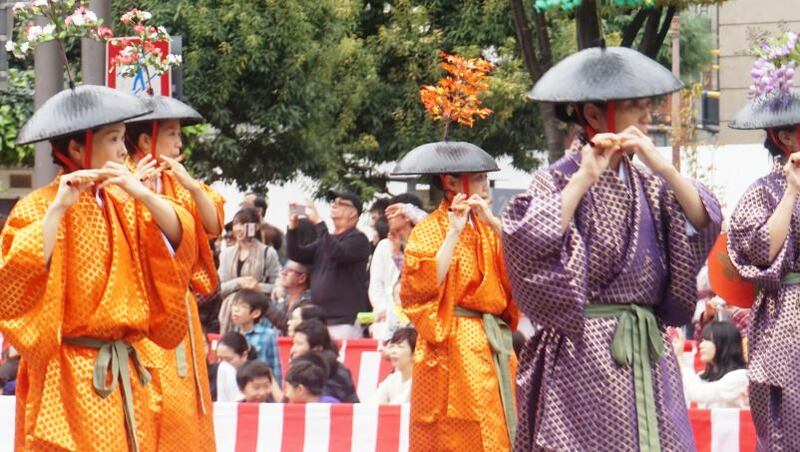 There are local residents who think these flutes and taiko drums are the Jidai Matsuri! The costumes, accessories, guns, etc., that they wear were replicated as accurately as possible to the original to reflect the respective era. They were crafted using traditional Kyoto techniques. These guns they are carrying are genuine! Very powerful. In addition to costumes, the parade also features historical figures. This photo shows one of Samurai who played active part at the end of edo era. 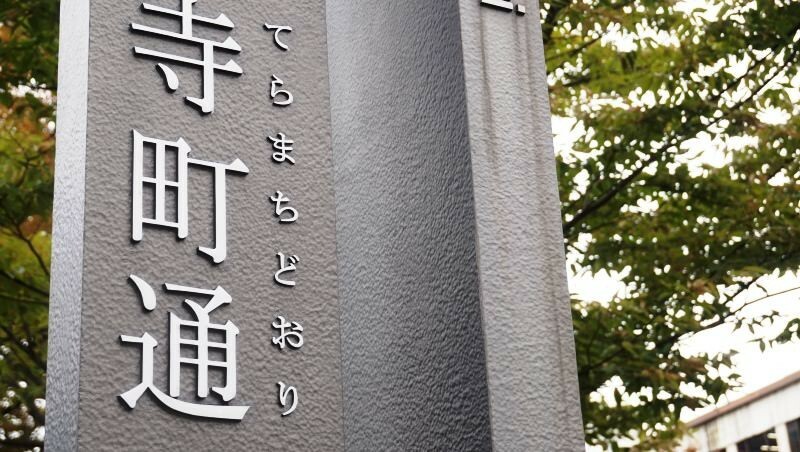 Many other figures that greatly had an impact on Japan's history also appeared. 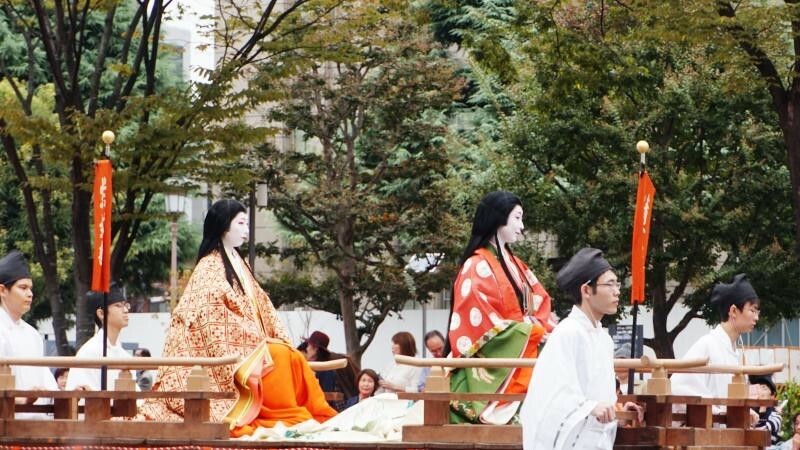 The Edo Period (1600-1868) section of the parade showed famous women who were active in Kyoto. This is Princess Kazunomiya, the sister of Emperor Komei. 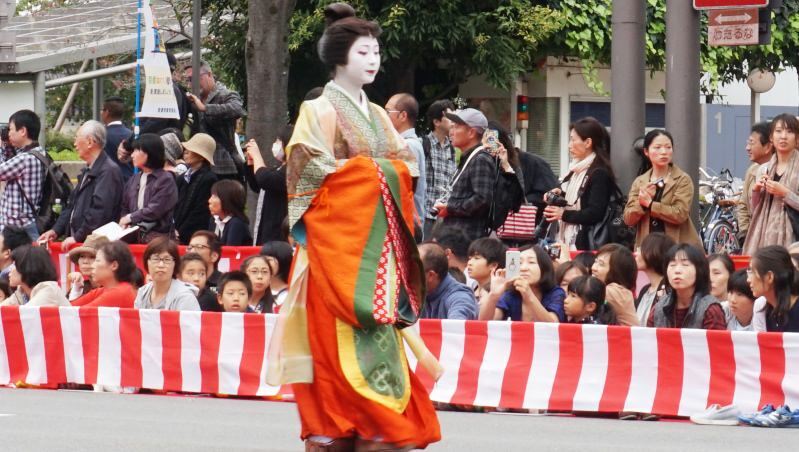 These historical women were portrayed by Kyoto's maiko (geisha apprentice). Such elegantly-dressed beautiful women are one of the main highlights of the parade. 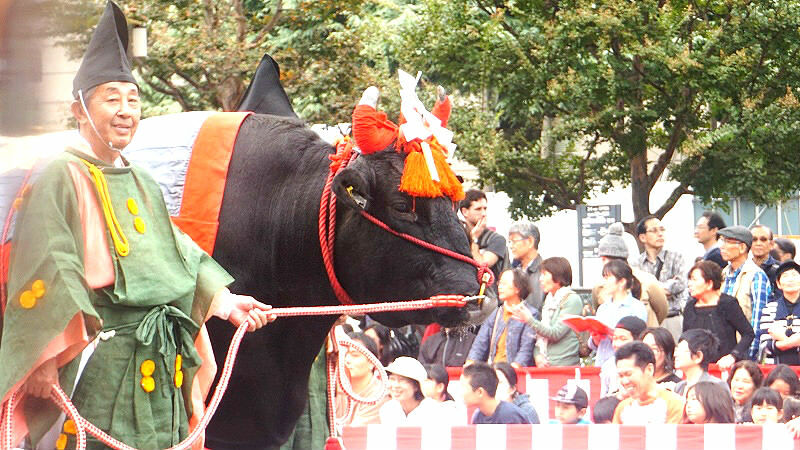 The Jidai Matsuri includes many horses and oxen used for riding or for carrying luggage. Well-groomed, beautiful horses and lovely oxen wearing decoration normally cannot be seen this close. In the Azuchi-Momoyama Period (1568–1600) section, feudal lords Nobunaga Oda and Hideyoshi Toyotomi can be seen. Dignified warriors in armor on horseback walk pass. 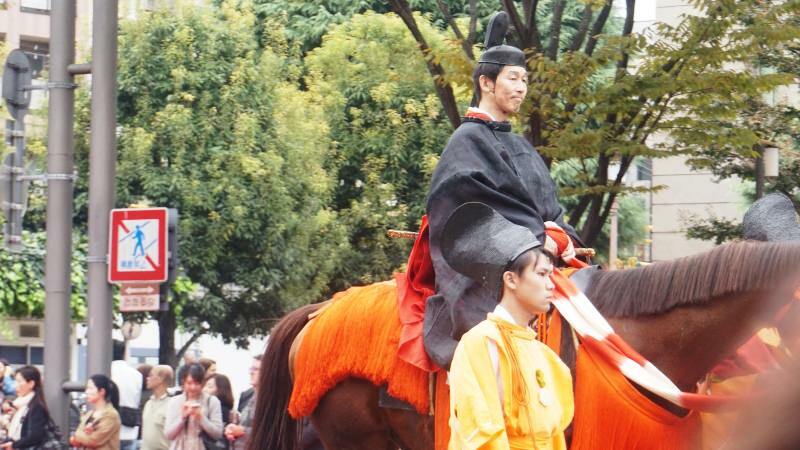 The Jidai Matsuri is like a parade of historical figures. They waved their hands at us or came closer to show their horses, which was very friendly throughout. When the era changes, the costume changes too. This samurai is from an era slightly before the Azuchi-Momoyama Period. His armor looks a little different. Finding these little differences in the costumes and the things they carry is another way to enjoy the festival! The Muromachi Period (1338-1573) section had merchant guilds. The furyu-odori dance, popular at the time, was performed. They wore colorful costumes and danced to taiko drums and flutes. 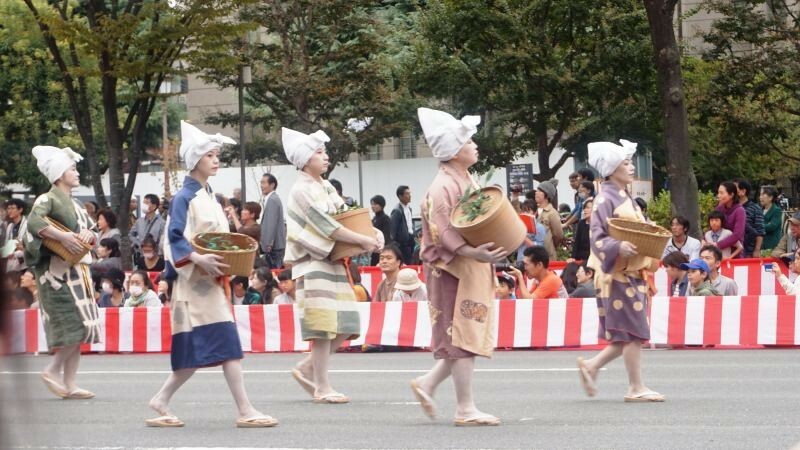 Now in the medieval period (1333-1392), we saw groups depicting traditional women laborers in Kyoto. Ohara-me were women in the Rakuhoku district in northern Kyoto who went around selling firewood and charcoal carried on their heads. Katsura-me were women in the Rakusai district of Kyoto who sold sweetfish caught in the Katsura River. 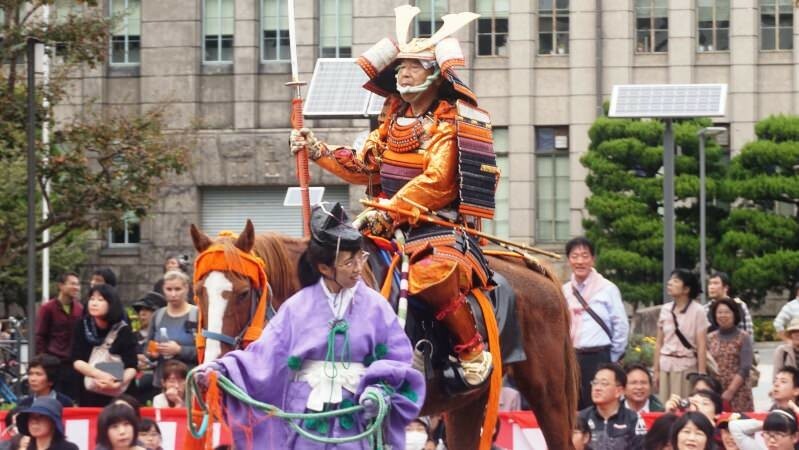 Samurai warriors were not the only ones on horseback. For the Heian Period (897-1185), court nobles like the Fujiwara Clan were elegantly depicted. 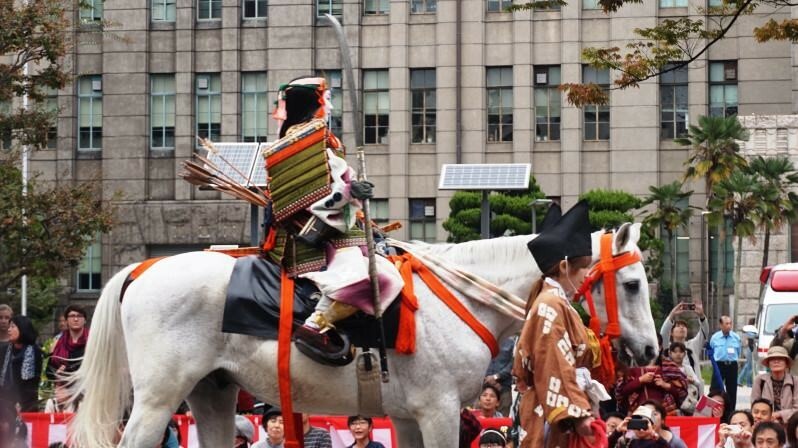 This woman is Tomoe-Gozen, the only woman wearing samurai armor and weapons in the parade. Very popular figure. During the Heian Period, a lot of Japanese artistic works like literature and poetry were created and passed down. On the left is woman novelist Murasaki Shikibu who wrote The Tale of Genji (Genji Monogatari). On the right is author Sei Shonagon, famous for The Pillow Book (Makura no Soshi). Both are very important historical figures in Japan. This is Komachi Ono, said to be one of the three most beautiful women in the world. She was a talented poet. Her hairstyle and wardrobe are slightly different from the other women. 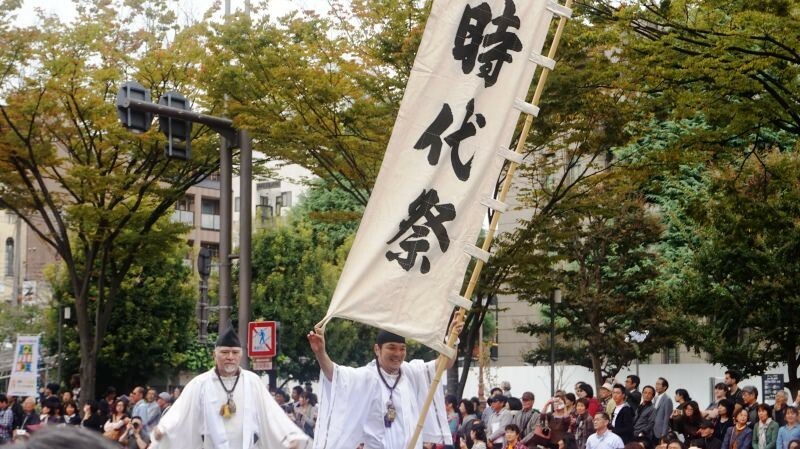 After the end of the parade, Enryaku Period (782-806) finishes, Shinko-retsu Procession starts. It is said this horen carriage carries the emperor, and he watches us inside. Although the parade is grand and colorful with the women attracting the most attention, this emperor's procession is actually the main purpose of the parade. After this, the parade ended after we watched it for two hours. 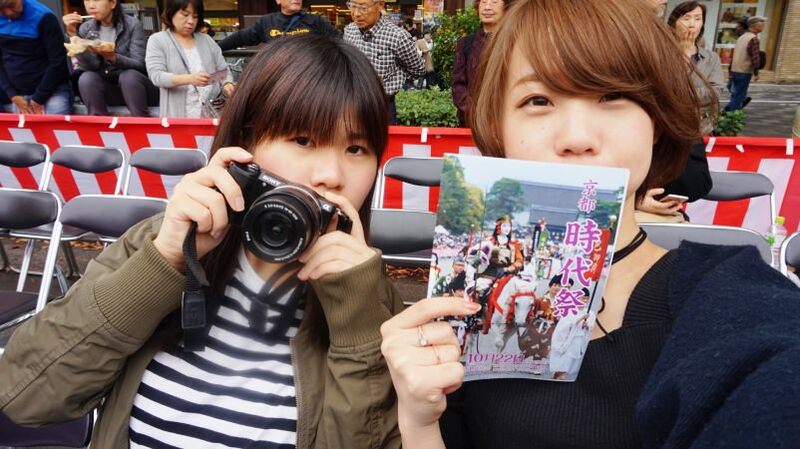 "Sharing Kyoto" editors Erika and Shiho. This was actually our first time to see Jidai Matsuri! Whether or not you are familiar with Kyoto's history, you would definitely enjoy the highly-refined costumes, impressive horses and oxen, samurai on horseback, elegant-looking women, and cute little children. Time goes very fast. Many people from overseas come to see this festival. If you visit Kyoto in autumn, you really should see it! 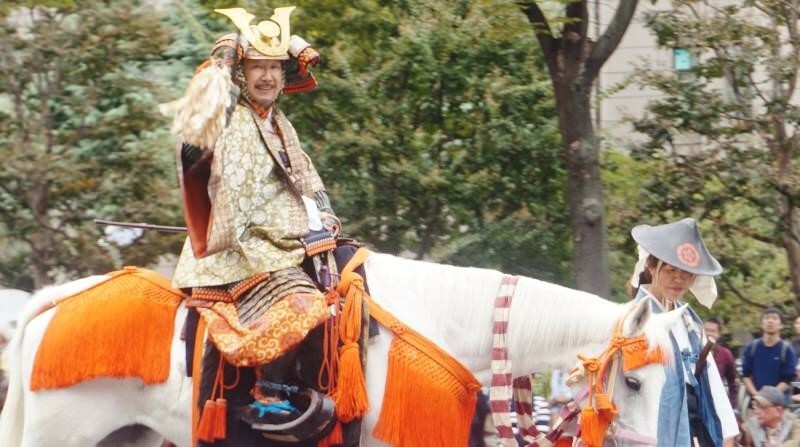 I thought it was a unique festival because I could see all of Kyoto's historical figures exquisitely depicted in a single procession! You can't really see such a festival elsewhere! The people in samurai costumes are also very friendly. If you call out their samurai names, they may even wave to you! Try calling names like "Nobunaga!" or "Hideyoshi!"